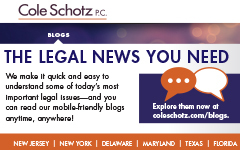 Cole Schotz, an Am Law 200 firm, provides legal services throughout the United States from its offices in New Jersey, New York, Delaware, Maryland, Texas, and Florida. We represent hundreds of businesses, large and small, and select individuals. Many have been clients for decades. We are known for the highly focused personal service we deliver. No matter how complex the legal challenge, you can be assured of dedicated service, 24/7 access to your legal team, and a relentless commitment to your success. We serve as your counselors, your business partner, and most importantly, a trustworthy ally. When you engage Cole Schotz, you gain access to an experienced team, distinguished by its passion for the practice of law and commitment to upholding the highest standards of the legal profession. Our ranks include former federal and local officials; former corporate counsel and Fortune 500 executives; certified civil trial attorneys; and fellows from the American College of Trial Lawyers and the American College of Bankruptcy. Superior character and abilities are highly valued at Cole Schotz – and have been the foundation of our success since 1928. The firm was founded by David L. Cole, a noted labor arbitrator and mediator, and Mendon Morrill, one of New Jersey’s foremost trial lawyers. David Cole served as Director of the Federal Mediation and Conciliation Service and counseled every president from Harry S. Truman to Gerald R. Ford in national labor crises. Mendon Morrill went on to serve with distinction as a judge of the United States District Court. Outstanding service as applied to the practice of law was the foundation for Cole Schotz, and it remains a cornerstone today. Contact us to learn more about Cole Schotz. Please click here to subscribe to our content.